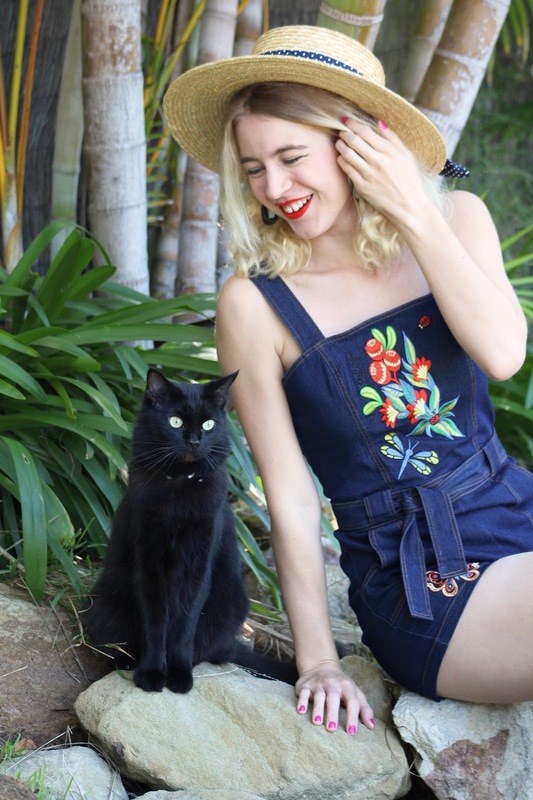 It may be winter here in Australia but I am finally posting this perfect denim playsuit that is so perfect for warmer weather! These photos were taken over a month ago and now it's the first day of winter, I'm a little behind in my posts but don't worry my Autumn and Winter outfits will be hitting the blog soon. Denim is usually a no-no in summer and I'm not really into denim shorts but this is the perfect denim outfit for hot weather and it's just oh so cute! Here is another new season offering by Voodoo Vixen, yes I really do love all of their playsuits! 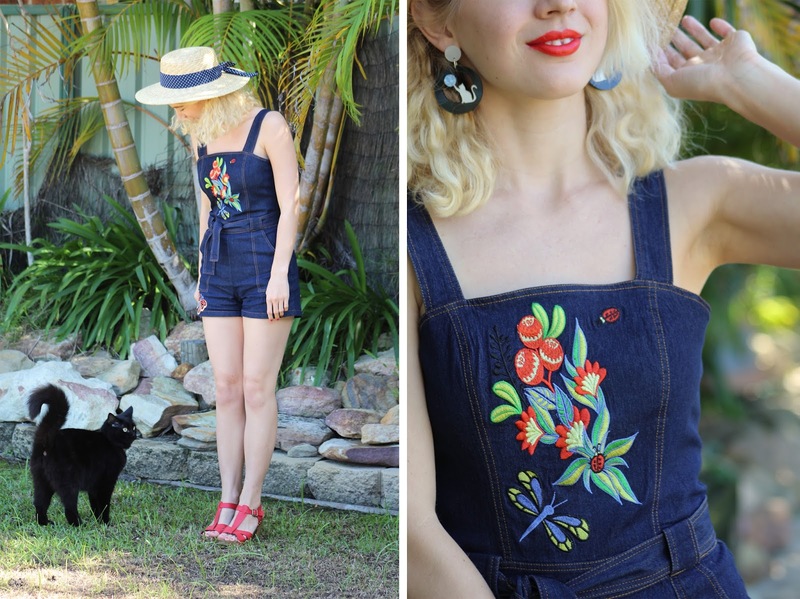 This one is made of beautiful light denim which is perfect for warm weather and how cute is the embroidery??? I am wearing my usual size small which is the perfect fit and super comfortable. It also has pockets, a waist tie and a back zip. I can't wait to wear it all spring and summer! I also love the length of this playsuit, I always feel over exposed when a they're is super short but this one and other playsuits by Voodoo Vixen seem to be just right. I'm eyeing up the Josie playsuit next, so cute! I went for simple styling with a wicker hat, a jelly bag and my trusty red heels that I bought for $10 on clearance about four years ago. Renee's cat Jinx wanted to be in some of the photos too which had me giggling and then I forgot that I was taking outfit photos for a couple of minutes. Tomorrow is Saturday and I have lots of blog stuff to catch up on, my dogs to walk (+ hug) and household chores to do. Hopefully the sun will be shining too! Have a great weekend! What a pretty outfit! I love jumpsuits. They're so cute! Very pretty! I'm a bit obsessed with embroidery right now, and it works perfectly here. I find playsuits and rompers really hard to fit, but this is so tempting! What gorgeous embroidery! I do love embroidered denim!